Green chiles are a common ingredient in Mexican food. They grow well in hot climates and they can be harvested throughout the summer, but they reach their peak in late summer and are best when harvested then. Green chiles come in thousands of varieties, and even some of the same types go by different names. This can be very confusing if you're looking for a specific type of green chile, so here are some of the more popular green chiles and some of the names they go by. Green Chile is good for you and your family. Pancho’s understands how important your health has become and that healthy eating and fresh roasted green chile is the perfect combination for our future. Healthy eating means healthy living. Pancho’s believes in the importance eating fresh and healthy foods daily. Here we share with you some of the facts about the glorious Green Chile and open our doors to hearing about your best green chile recipes and tips on how you enjoy this amazing pepper. Anyone who has eaten fresh roasted green chiles can attest to the intense sinus clearing effect and the overall sensation that it creates when you are eating it, but lesser known are the green chile nutritional facts and health benefits. Green chiles are rich in vitamins A and C with the dried version higher in vitamin A and the fresh version higher in vitamin C. They can contain as much as six times the amount of vitamin C as a single orange. Their vibrant color signals high amounts of the antioxidant beta-carotene, which supports the cardiovascular system, as well as helps maintain the health of the skin, eyes and immune system. Green chiles also contain vitamins B and E, and are a good source of iron and potassium. Green chiles do not contain fat or cholesterol and help block the body's absorption of cholesterol while remaining low in calories. These long, bright-green chiles were brought from New Mexico in the early 1900's and were bred to be milder to suit the taste of Californians at the time. They were originally brought to Anaheim, a city in California, and they go by either name. These are one of the few chiles that retain their names when ripened and dried into red chiles. Thus if a recipe calls for Anaheim or California chiles, you should make sure you're getting the right ones for the recipe, fresh and green or red and dried. 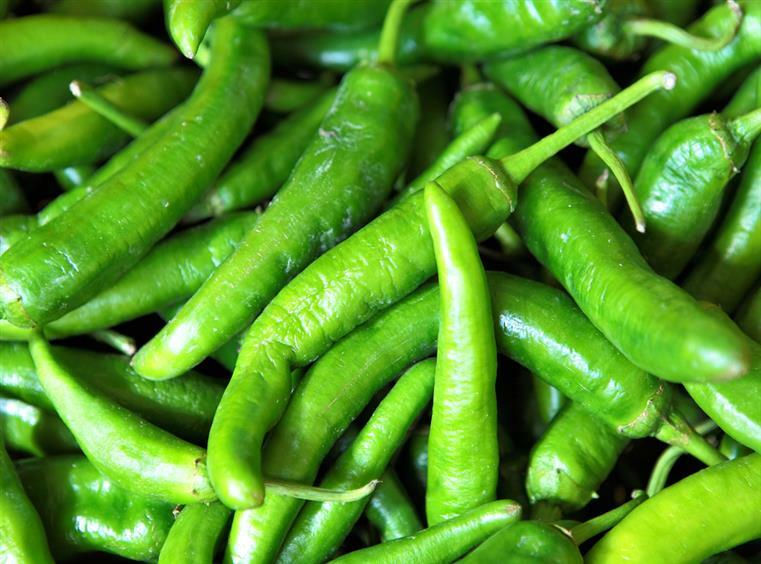 Keep in mind that while these green chiles are some of the mildest around, they can still vary in their heat level. This is a great chile for making Chile Verde. From Puebla, Mexico, this type of green chile is a beautiful dark green hue and is much wider than the Anaheim chile. They are usually slightly hotter than the Anaheim as well, but sometimes they can be very mild. The poblano chile is dried when green and then it is called an ancho chile. This chile is great for making Chile Rellenos, Rajas and Chiles en Nogada. Sometimes the Poblano is mistakenly referred to as a Pasilla chile. These long green chiles are virtually identical to California and Anaheim chiles, with one distinct difference. They are much, much hotter. Hatch chiles are New Mexico chiles that are grown in the small town of Hatch, New Mexico and are considered premium green chiles. Every year there is a Hatch Chile Festival on Labor Day where up to 30,000 people come to the little town to buy and eat these delicious chiles. Hatch and New Mexico chiles can be used for the same dishes as California and Anaheim chiles but they are significantly hotter. The Chilaca green chile is long and narrow like the New Mexico chile, but it is a darker green in color like the poblano chile. When the Chilaca is dried, it is known as a pasilla chile. Another version is "Pasilla de Oaxaca" which is a smoked pasilla chile. While these little chiles are green, they are very hot and more often used in salsas and as a flavoring, not as the main component of a dish. They can be roasted, but they can also be chopped up in their fresh state (discarding the seeds) and used as a topping or seasoning to add heat and flavor. What's the Difference Between New Mexico Green Chiles and Red Chiles? New Mexico is famous for its chiles and its chile, both come in forms green and red. Some divide the state into the southern green-leaning part and the northern red-tending area, but it ain't that simple. Most restaurants offer both - green or red chile poured over your enchiladas or your chile rellenos or really anything you can think of. So what's the difference? Time. Time is the difference between green and red chiles in New Mexico. New Mexico chiles – such as the famed Hatch chiles grown in and around Hatch, New Mexico – are often just called New Mexico chiles and come in many varieties. They are usually labeled "Anaheim chiles" outside New Mexico. They start green – when many people harvest and roast them – and turn red as they ripen. Some people roast them red, but more commonly they are hung to dry before being ground into a chile powder as fine and flavorful as you can imagine. Red chiles are one of the most common ingredients in Mexican food. Chiles grow well in hot climates and they can be harvested throughout the summer in their green state, but some chiles are left on the plant until autumn when they change from green to their final color of yellow, orange, purple or red, depending on the variety. Some varieties get hotter as they turn from green to their final hue. Red chiles come in thousands of varieties, and are most often dried for easy storage. The dried chiles are sold by weight, or on ristra which is a wreath made out of dried chiles. Dried red chiles are leathery and usually need to be rehydrated before use. Anaheim and California chiles start out as long, bright green chiles and they turn bright red when ripe. They are then dried, and known as their "green" names as well as chile seco del norte. These chiles are some of the mildest dried red chiles available. These dried red chiles are usually about 5-7 inches in length and 1-2 inches wide. The guajillo chile is made by drying the mirasol chile. Once dried, the guajillo chile is a deep red and has medium heat, although if you are not used to hot chiles at all, you might even consider them hot. They have a slight fruitiness to their flavor and are excellent in salsas and chile sauces. Guajillos are medium-sized chiles ranging from 2-4 inches in length and they are great in Adobo Sauce and Chile Colorado. Chipotle (say chip-OAT-lay) chiles start out as green jalapeños but they are left on the plant until they turn red. Then they are smoked and dried which results in a brownish colored dried chile. Chipotles are hot and have a distinct, strong smoke flavor. You can find them in their dried form, or canned in an adobo sauce. Either of the versions are excellent additions to soups, stews, or anywhere where you want a rich, smoky flavor. Most chiles flatten out and become wrinkly when they are dried, but Cascabel chiles retain their round shape even after drying out. They are smaller chiles that are about 2 inches or less in diameter. Cascabels are hot and provide an earthy, nutty flavor to the dish they are added to and they are perfect for the traditional Mexican dish Birria. These small red chiles are long and thin, ranging from 2-3 inches in length. Chiles de árbol also maintain their bright red hue, even after they are dried and they are very hot, similar to cayenne pepper. You can find them whole, dried or dried and powdered. If you handle these chiles raw, take great care to not touch your face and make sure to wash your hands thoroughly as the chile oils are hard to remove. The chiles with the highest rating on the Scoville scale exceed one million Scoville units, and include specimens of naga jolokia or bhut jolokia and its cultivars, the "Dorset naga" and the "Ghost chile", neither of which has official cultivar status. Numerical results for any specimen vary depending on its cultivation conditions and the uncertainty of the laboratory methods used to assess the capsaicinoid content. Pungency values for any pepper are variable, owing to expected variation within a species—easily by a factor of 10 or more—depending on seed lineage, climate (humidity is a big factor for the Bhut Jolokia; the Dorset Naga and the original Naga have quite different ratings), and even soil (this is especially true of habaneros). The inaccuracies described in the measurement methods above also contribute to the imprecision of these values. 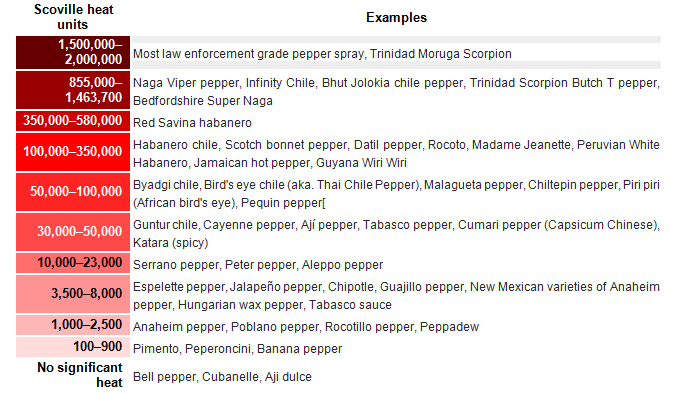 When interpreting Scoville ratings, this should be kept in mind.